Harry joined United on an S form whilst with local side St Francis. He spent most of his two seasons at Tannadice in the reserves and was released in May 1972 to join Forfar Athletic. Harry was born on this date in . Although it wasn't certain at the time, this proved to be manager Jerry Kerr's last match as manager and his side continued their climb up the table with their second successive victory. Fullback Harry Mollison made his first team debut. 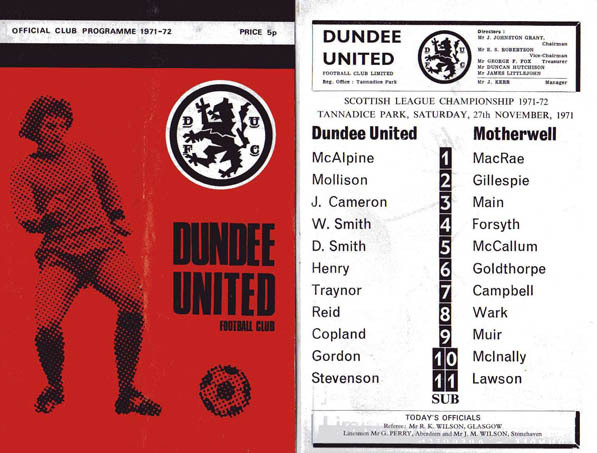 With only 3,000 on the Tannadice terracings, there was a distinct lack of atmosphere which hardly helped the players. However, United were the brighter of the two sides and deservedly went ahead after 25 minutes when Alan Gordon bulleted a header from a Henry free-kick past MacRae.